Hatfield Business Park is a thriving mixed use development set within a carefully landscaped environment. The park sits on 400 acres of the former Hatfield Aerodrome. The park now hosts 3.5 million sq ft of business space creating 13,000 jobs. Elsewhere on the park there are over 2,000 homes, 18 retail units, Europe's largest Health and Racquets club, a police station and a University campus. With a 25 minute rail link to central London and the A1(M) link to the M25 close by, Hatfield Business Park offers an unrivalled mix of amenity and accessibility. Situated just off the A1(M), the park boasts excellent road, rail and air links. This has also helped to integrate the park with Hatfield, creating a vibrant extension to the town. Major investment in the on-site transport infrastructure has further strengthened local links and made it easier for commuters and leisure visitors to come and go. The park is well connected with its proximity to the A1(M), M25, M1, M11, M40 and central London. Its infrastructure has been specially designed to allow a smooth flow of high volume vehicles. It also offers large, state-of-the-art space with 24hr use and access. The International Airports of Heathrow, Stansted and Luton are all within an hours drive. With 90% of the Park already completed, this is a rare opportunity to join an established and thriving community where business, residential, leisure and educational space integrates seamlessly. The success of the Park is underlined by the diversity and calibre of occupiers it has already attracted. The scale of the space on offer makes it ideally suited to a range of purposes, with particularly impressive options for specialist accommodation and laboratories required by R&D businesses. On-site facilities make the Park an excellent venue for national and international conferences and the secure, well-managed environment offer both a pleasant place to work and the ideal setting for confidential research activities. Additionally, great attention has been paid to environmental impact, creating the ability to deliver the latest in green design to accommodate all your aspirations for sustainability. Hatfield Business Park is the former site of the renowned Hatfield Aerodrome, which was home to de Havilland, Hawker Siddley and later British Aerospace (BAE). These companies were responsible for many aviation breakthroughs, including the Comet, the world's first commercial jetliner, halving travel times from London to New York. The Business Park is now home to an impressive array of businesses and the bustling University of Hertfordshire. It has grown into one of the UK's most established and successful mixed-use business arenas. The abundance of amenities provided both in and around the Park make this an enviable location. Whether it's a delicious bite to eat, an invigorating morning workout, or simply a supermarket shop; day to day life is made as easy as possible at Hatfield Business Park. 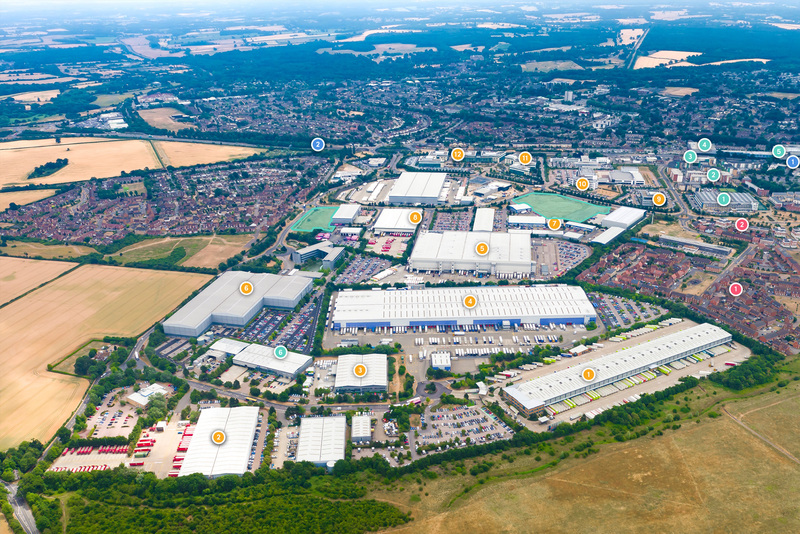 Hatfield Business Park is well sited for access to the national motorway network and London. Direct rail links to King's Cross makes Europe closer than ever by train, although several major airports are also easily accessible - the choice is yours. Closer to home, plentiful bus routes keep the Park connected locally. Now an international business centre and home to the bustling Hertfordshire University, Hatfield originally dates from Saxon times, but its place in history is famously sealed as the birthplace of the jet engine in the 1930s. Ellenbrook fields is an area of private land has been opened up to the public for your enjoyment. A series of linking permissive footpaths, suitable for walkers and cyclists have been created through the areas of open grassland and cattle grazing. Today, it is home to leading businesses including EE, Ocado, Booker, Eisai, the Environment Agency, Porsche Cars (GB) Ltd, Royal Mail, DHL, Computacenter and Affinity Water. As with all Arlington developments, great attention has been paid to environmental impact. Arlington has the ability to deliver the latest in green design to accommodate all your aspirations for sustainability.